The colleague I was talking to took a photo - I am sure things like this don't happen that often. I am always astonished by what is around us if we only look. 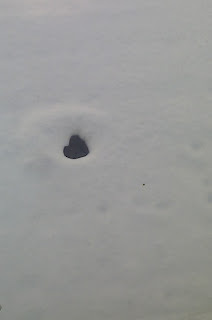 A perfect heart in the snow! Isn't nature amazing - the snow must have melted this way over the manhole cover and it looked beautiful. Happy Valentine's Day! I have been knitting quite a bit but have been flirting with too many projects to have much to show for it. The one project I have finished are these lovely Berry Hill mitts, using this pattern, for a friend who does a lot of ice skating. I finally got the bit between my teeth and decided to finish the Debbie Bliss ribbed cardigan that I started about two and a half years ago. I had procrastinated about finishing it largely because I had been convinced that it would not fit, but then I decided that I couldn't bear having it sitting there tormenting me, just waiting to be sewn up. I decided that I would simply give it to someone else if it didn't fit. So, I finally finished it a couple of weeks ago and, to my amazement, it fits! I am so delighted to have finished something - I seem to have lots of projects on the needles but none near completion. I feel inspired to go on with the finishing! I can hardly believe she is 10 - it seems so grown up! I managed a couple of hours work before the issue of health and safety (ie no children in the office) meant that I had to go home. But I was given a laptop allowing me remote access to my desktop and so was able to work from home the rest of the day and today, when school was closed altogether. I am pleased with how this is coming out, but am also very tempted to knit a slouch beret - there are so many lovely patterns around. 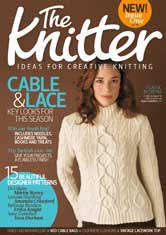 I like Porom and Relm from Brooklyn Tweed and I also like Ysolda's Icing Swirl pattern. It is good to see some new activity in the magazine market, despite the constant economic gloom that seems to permeate every aspect of the media. Good news seems thin on the ground, so I was pleased that Future have chosen to invest in a new publication. It certainly brightened my day! This weekend, in the spirit of my new decluttering, I had a major assault on Edward and Lily's room and feel so much better now that we have cleared out some things. Lily was very good about going through her things and I feel that the toys they have they will now be able to access more easily. Edward too was able to decide that there were toys he no longer needed, and so we managed to give a load to a local charity shop. I felt worn out afterwards, but very pleased with the end result. There is a lot more I want to achieve. I figure that if moving is not an option then we can make the house feel bigger by sorting out everything in it! Although most of my family doesn't take my knitting obsession seriously, I did get a couple of knitting-related presents for Christmas. It is knitted using Alice Starmore yarn - I feel very spoiled! She also gave me a couple of balls of Kaffe Fassett Regia sock yarn - gorgeous! and am planning another couple of baby garments, possibly even a blanket. ...and all through the house, not a creature was stirring (except for Ingrid, who still had some last-minute knitting to finish off). I know it is ages (half a year!) since I blogged, but I am still here, still knitting. The job I started at the end of February is taking up a great deal of time and the little time I have left over is given to the children. Knitting has to fit in to the small windows of opportunity I have - on the train on the way to and from work (when I can get a seat) and in the evenings when the chores are done. This year has been quite eventful - other than my going back to work full time after a 10-year break (very scary, but definitely the right decision, particularly given the current economic woes), I have been in hospital twice (all fine now! ), and we have tried (and failed) to move house. After giving up on moving for the moment, we have tried to content ourselves with moving things around a bit at home and now have the computer in the dining room, which makes life a lot easier. We are also planning for us all to move bedrooms, but we need to get some minor work done first. I am optimistic that I will be able to get back to blogging now that the family has settled into a new routine around my job and the computer is easily accessible. We have also upgraded the computer so we now have one that works properly - our old computer was so creaky that everything was difficult on it! Yes, it is the Misti alpaca ribs and ruffles scarf, an excellent free pattern. I did manage to complete everything I had planned to, and had a good Christmas - everyone was pleased with their gifts. This coming year I want to try to make some small adjustments to our life. I want to be more organised with the cooking (this has been one area that has been very hard to keep on top of with my new job). I have bought two books which I hope will make a difference to the meals that I plan. The first, How to Feed Your Whole Family a Healthy Balanced Diet, with Very Little Money and Hardly Any Time, Even If You Have a Tiny Kitchen, Only Three Saucepans ... - Unless You Count the Garlic Crusher... by Gill Holcombe, I have had for a while, but have not used. Today, I made apple cake from it and plan to use some of the more general principles in it to plan our weekly shopping and eating. I have also bought The Kitchen Revolution, which, although I don't intend to follow it to the letter, has some sound principles in it. Despite our unsuccessful attempt to move house (it would be great to have a bit more space) I am well aware of how lucky we are as a family and how comparatively privileged we are. Like everyone else in the current credit crunch, however, we need to make some economies, and this coming year I plan to do what everyone recommends you do to economise - keep track of where all your money goes down to the last penny. So, like Sabine, who has been reading my old copy of Not Buying It by Judith Levine, I intend to downsize my wool stash. I shall buy yarn only for specific projects or for gifts and try to use more of my stash. I also intend to sort out the books in the house and all our clothes - I have already started down this road and have been thinning out the children's clothes considerably. There are some great ideas in Levine's book (although she can come across as slightly irritating sometimes - she still runs two houses and two cars in the book), and it is certainly thought-provoking. I have also recently read Kath Kelly's book on how she lived for a pound a day, which, in a similar vein, gives food for thought. While Kath Kelly's year holds much to admire, I think it would be hard to live like this with three children to feed, although I am tempted to use some of her ideas. If moving is not an option for us because the housing market is so stagnant, then decluttering certainly is. As those of you who know me are well aware, however, I am not the tidiest person in the world, so this will be a real challenge for me. But I feel that with the economy the way it is and the uncertainty hanging over us all, we should make the most of what we have and I certainly have a lot to be grateful for. So, one step at a time, 2009 will be a journey for me into a more thoughtful and considered way of life. One incentive for me is to see how I feel about each purchase if I keep track of everything. I have done this before (when I was saving for my first flat) and actually found it just as satisfying as consuming. But having a family is different. I hope that we will all learn from the coming year, whatever it may bring. The girls had a Brownie outing last Sunday and so I had a lovely day just with Edward. So the two of us took a trip to the London Transport Musuem and had great fun, travelling back in time in the lift, looking at all the trains, pretending to drive a Tube train and sitting on the top deck of trams. There were some great posters of places you could go on the railway or the Underground and I particularly liked this advertisement for Golders Green, complete with knitting in the garden - doesn't it look lovely! A family idyll. Because today's INSET day was tagged on to the end of half-term I wanted to do something special with the children on my extra day off, so we went to the Psycho Buildings exhibition at the Hayward Gallery. This was a great show for the children, and although we were disappointed to find height and age restrictions for some of the installations, we had the surreal experience of boating on one of the terraces - what fun! A colleague who I used to do freelance work for was due to have a baby in May so I managed to finish this kimono over the weekend and it is now in the post - I hope she likes it! 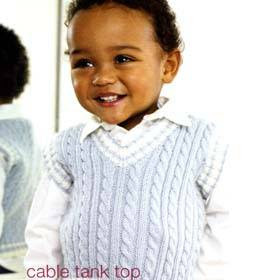 I still haven't got bored with knitting this pattern - it is so sweet and simple and everyone I have made it for says how easy it is to dress a baby in! The children have a day off today - an INSET day - and so I have taken an extra day off work to be with them. I must say that going back to work will be difficult tomorrow after over a week off. I have really enjoyed being with the children and am feeling bad about being at work again from tomorrow. It has been bittersweet spending time with them over the holiday - I am fretting about the whole work thing but hope it will settle down again once I get back into the swing of things.